In today’s world, many of the items we own can lose their luster over the years. Pools are no different. At Rhine Pools, we excel in pool renovations that breathe new life into your old pool and backyard. We give your outdated pool a face-lift as well as upgrade your equipment using more efficient technology and automation. The first step in our process is to conduct a complete site survey of your pool and pool equipment. We’ll also pay close attention to the surrounding landscaping, hardscaping, lighting, and drainage to gather ideas for the renovation. The usual pool renovation includes new tile, coping, pool resurfacing, and possibly the pool deck. Rhine will also check your existing equipment, plumbing, and electrical service, and replace it if necessary as well as updating to the latest technology for both heating and the cleaning your pool. If desired, our architects can create new designs for your consideration. Once you’ve decided on a plan, the project can begin. With Rhine Pools you will have one single point of contact from start of construction until you are ready to take your first swim. You’ll deal with your personal Rhine Pool project manager throughout the entire renovation. Pool renovations include pool resurfacing, and whether you want new plaster, Pebble Tec, Diamond Bright, or another type of surface, we partner with the very best surface services in the state. Once the surface has been applied, we make sure it’s finished correctly. 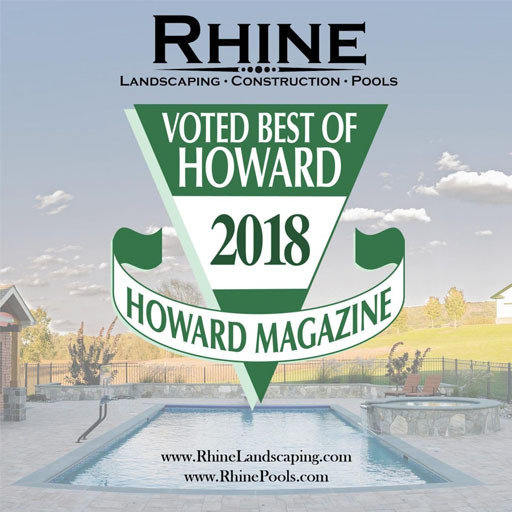 In addition to the actual pool renovation, Rhine Pools can add new landscape features and elements, along with hardscaping such as pool decks and walkways, outdoor kitchens, pool houses, shade structures, new composite decks, or screened porches. Cleverly placed pool lighting and other pool features such as spas, waterfalls, and slides can round out the overall look and feel of the area. Rhine Pools has been completing successful pool renovations for more than a decade. Contact us today to find out how we can breathe new life into your old pool. Find out more by contacting us today at 410 442 2445.